Luther Ronzoni Vandross, Jr. (April 20, 1951 – July 1, 2005) was an American singer, songwriter and record producer. Throughout his career, Vandross was an in-demand background vocalist for several different artists including Judy Collins, Chaka Khan, Bette Midler, Diana Ross, David Bowie, Janet Jackson, Barbra Streisand, Ben E. King, and Donna Summer. He later became the lead vocalist of the group Change, which released its certified gold debut album, The Glow of Love, in 1980 on Warner Bros. Records. After Vandross left the group, he was signed to Epic Records as a solo artist and released his debut solo album, Never Too Much, in 1981. Luther Ronzoni Vandross, Jr. was born on April 20, 1951 at Bellevue Hospital in Manhattan, New York City. He was the fourth child and second son of Mary Ida Vandross and Luther Vandross, Sr. His father was an upholsterer and singer, and his mother was a nurse. Vandross was raised on Manhattan's Lower East Side in the NYCHA Alfred E. Smith Houses public housing development. At the age of three, having his own phonograph, he taught himself to play the piano by ear. Vandross's father died of diabetes when Vandross was eight years old. In 2003, Vandross co-wrote the song "Dance with My Father" and dedicated it to him; the title was based on his childhood memories and his mother's recollections of the family singing and dancing in the house. His family moved to the Bronx when he was nine. His sisters, Patricia "Pat" and Ann began taking Vandross to the Apollo Theater and to a theater in Brooklyn to see Dionne Warwick and Aretha Franklin. Patricia sang with the vocal group The Crests, and was featured on the songs "16 Candles" and "Sweetest One". In high school, Vandross performed in a group, Shades of Jade, that once played at the Apollo Theater. While a member of a theater workshop, Listen My Brother, he was invoiced in the singles "Only Love Can Make a Better World" and "Listen My Brother". He appeared in the first series of Sesame Street during 1969. Vandross graduated from William Howard Taft High School in 1969, and attended Western Michigan University for a year before dropping out to continue pursuing a career in music. He added backing vocals to Roberta Flack & Donny Hathaway in 1972. In 1978, Vandross sang lead vocals for disco band Greg Diamond's Bionic Boogie on the song titled "Hot Butterfly". Also in 1978, he appeared on Quincy Jones's Sounds...and Stuff Like That! !, most notably on the song "I'm Gonna Miss You in the Morning" along with Patti Austin. Luther also sang with the band Soirée and was the lead vocalist on the track "You Are the Sunshine of My Life"; he also contributed background vocals to the album along with Jocelyn Brown and Sharon Redd, each of whom also saw solo success. Additionally, he sang the lead vocals on the group Mascara's LP title song "See You in L.A." released in 1979. Vandross also appeared on the group Charme's 1979 album Let It In. Vandross released a series of successful R&B albums during the 1980s and continued his session work with guest vocals on groups like Charme in 1982. Many of his earlier albums made a bigger impact on the R&B charts than on the pop charts. During the 1980s, two of Vandross' singles reached No. 1 on the Billboard R&B charts: "Stop to Love", in 1986, and a duet with Gregory Hines—"There's Nothing Better Than Love." Vandross was at the helm as producer for Aretha Franklin's Gold-certified, award-winning comeback album Jump to It. He also produced the follow-up album, 1983's Get It Right. 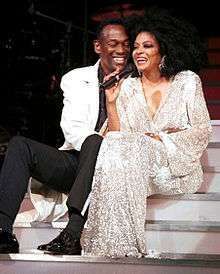 Vandross wrote and produced "It's Hard for Me to Say" for Diana Ross from her Red Hot Rhythm & Blues album. Ross performed the song as an a cappella tribute to Oprah Winfrey on her final season of The Oprah Winfrey Show. She then proceeded to add it to her successful 2010–12 "More Today Than Yesterday: The Greatest Hits Tour. Vandross also recorded a version of this song on his Your Secret Love album in 1996. He made two public appearances at Diana Ross's Return to Love Tour at its opening in Philadelphia at First Union Spectrum and its final stop at Madison Square Garden in 2000. Vandross hit the top ten again in 1994, teaming with Mariah Carey on a cover version of Lionel Richie and Diana Ross's duet "Endless Love". It was included on the album Songs, a collection of songs which had inspired Vandross over the years. He also appears on "The Lady Is a Tramp" released on Frank Sinatra's posthumous Duets album. At the Grammy Awards of 1997, he won his third Best Male R&B Vocal for the track "Your Secret Love". Throughout his career, Vandross was very guarded about his private life and sexuality; on the many occasions he was confronted by interviewers about it, he'd become defensive and short-tempered. After his death in 2005, many media outlets began to focus on Vandross's sexuality, including The Advocate—who was the first major publication to explicitly call him a "gay artist"—and The Village Voice. "Though he never came out as gay, bisexual, or even straight, you had to be wearing blinders—as many of his fans, particularly female, must have been—to overlook his queerness", Jason King wrote in Vandross' obituary in The Village Voice. According to Gene Davis, a television producer who worked with Vandross several times, "everybody in the business knew that Luther was gay". Bruce Vilanch, a friend and colleague of Vandross, later said Vandross confided details about his personal life to him; "He said to me, 'No one knows I'm in the life.' ... He had very few sexual contacts", Vilanch told Out magazine in 2006. He added that Vandross experienced his longest romantic relationship with a man while living in Los Angeles during the late 1980s and early 1990s. Vandross suffered from diabetes and hypertension, both of which may have been brought on by family genetics as well as lifestyle and nutrition. He had just finished the final vocals for the album Dance with My Father when on April 16, 2003 he suffered a severe stroke at his home in New York City. The stroke left him in a coma for nearly two months, during which time he also had to fight both meningitis and pneumonia (which required a tracheotomy). The stroke also left Vandross with difficulty speaking and singing, as well as confined to a wheelchair. On February 8, 2004 at the Grammy Awards held at the Staples Center in Los Angeles, Vandross appeared in a pre-taped video segment to accept his Song of the Year Award for "Dance with My Father". In addition to thanking his fans for their support throughout his illness and recovery, he said, "When I say goodbye it's never for long, because I believe in the power of love" (he sang the last six words). His mother, Mary (1922–2008), accepted the award in person on his behalf. Following a May 6, 2004 appearance on The Oprah Winfrey Show, he was never seen in public again. Vandross died on July 1, 2005 at the JFK Medical Center in Edison, New Jersey, at the age of 54. After two days of viewing at the Frank E. Campbell Funeral Chapel, his funeral was held at Riverside Church in New York City on July 8, 2005. Cissy Houston, founding member of The Sweet Inspirations and mother of Whitney Houston, delivered a heartfelt rendition of "Deep River" at the funeral service. Vandross is buried at the George Washington Memorial Park in Paramus, New Jersey. He was survived by his mother, Mary Ida Vandross, who died in 2008. Vandross's estate left an undisclosed major gift to the Juvenile Diabetes Research Foundation. J Records released a song, "Shine"—an upbeat R&B track that samples Chic's disco song "My Forbidden Lover"—which reached No. 31 on the R&B chart. The song was originally slated to be released on the soundtrack to the movie, The Fighting Temptations, but it was shelved. A later remix of the song peaked at No. 10 on the Club Play chart. "Shine" and a track titled "Got You Home" were previously unreleased songs on The Ultimate Luther Vandross (2006), a greatest hits album on Epic Records/J Records/Legacy Recordings that was released August 22, 2006. ↑ Barker, Andrew (June 3, 2014). "Luther Vandross Receives Star on Walk of Fame". Variety. Retrieved September 20, 2014. ↑ "Vandross' Funeral Soulful and Powerful". Yahoo! News. July 8, 2005. Retrieved December 2, 2006. ↑ "Obituary: Luther Vandross". BBC News. July 1, 2005. Retrieved December 2, 2006. 1 2 3 4 5 6 7 8 Walters, Barry (April 1987). "Soul God". Spin. Spin Media LLC. 3 (1): 31–33, 97. Retrieved September 21, 2014. ↑ "Luther Vandross' Mother Thanks Fans For Prayers; Says Singer Is Making Progress". Jet. Johnson Publishing Company. 103 (21): 16–17. May 19, 2003. ISSN 0021-5996. Retrieved September 20, 2014. 1 2 3 4 5 6 7 8 9 10 11 12 13 Christian, Margena A. (July 24, 2005). "Luther Vandross: R&B Superstar 1951–2005". Jet. Johnson Publishing Company. 108 (4): 26–38. ISSN 0021-5996. Retrieved September 21, 2014. 1 2 3 Cartwright, Garth (July 4, 2005). "Obituary: Luther Vandross". The Guardian. Retrieved May 24, 2014. 1 2 3 Coombs, Orde (February 15, 1982). "The Voice of The New Vulnerability". New York. New York Media, LLC. 15 (7): 45–49. ISSN 0028-7369. Retrieved September 20, 2014. ↑ "Luther Vandross' Mother Becomes Spokesperson For Diabetes". Jet. Johnson Publishing Company. 105 (9): 12. March 1, 2004. ISSN 0021-5996. Retrieved September 20, 2014. ↑ "Luther Vandross Inducted into Bronx Walk of Fame". Jet. Johnson Publishing Company. 112 (8): 32. August 27, 2007. ISSN 0021-5996. Retrieved October 10, 2014. 1 2 3 4 Seymour, Craig (September 2001). "Searching". Vibe. Vibe Media Group. 9 (9): 166–170. ISSN 1070-4701. Retrieved September 21, 2014. ↑ George, Lynell (July 2, 2005). "Luther Vandross, 54; 'Soul Balladeer' Sang With Eloquence and Restraint". Los Angeles Times. Retrieved November 19, 2015. 1 2 3 4 5 6 7 Leeds, Jeff (July 2, 2005). "Luther Vandross, Smooth Crooner of R&B, Is Dead at 54". The New York Times. Retrieved May 24, 2014. ↑ Witchel, Alex (May 28, 2003). "Miss LaBelle's Kitchen: Hot Sauce and Gold Lamé". The New York Times. Retrieved November 19, 2015. ↑ "Luther Vandross Dies Aged 54". davidbowie.com. July 2, 2005. 1 2 3 Grein, Paul (February 13, 1982). "Vandross Cooks Up a Storm". Billboard. 94 (6): 6, 53. Retrieved November 15, 2015. ↑ "Luther Vandross". The Telegraph. July 4, 2005. Retrieved November 15, 2015. ↑ Edwards, Michael (April 11, 2012). "Todd Rundgren's Utopia Live At Hammersmith Odeon '75". Exclaim!. Retrieved November 19, 2015. ↑ Johnson, Phil (October 23, 2011). "'Barry may be the walrus of love. But Luther is the real thing'". The Independent. Retrieved November 15, 2015. ↑ Neal, Mark Anthony (April 22, 2013). Looking for Leroy: Illegible Black Masculinities. New York University Press. p. 147. ISBN 978-0-8147-6060-4. Retrieved September 20, 2014. ↑ Oshinsky, Matthew (September 10, 2009). "Born to swing: Nat Adderley Jr. returns to his roots". The Star-Ledger. Retrieved September 20, 2014. ↑ Grien, Paul (September 4, 1982). "Arif, Aretha Back on Top; And Now, It's Miller Time". Billboard. Nielsen Business Media, Inc. 94 (34): 6. ISSN 0006-2510. Retrieved September 20, 2014. ↑ Bego, Mark (February 10, 2010). Aretha Franklin: The Queen of Soul. Da Capo Press. p. 215. ISBN 0-7867-5229-7. ↑ Waldron, Clarence (June 17, 1985). "Luther Vandross Tells What Inspires Him As Songwriter And Entertainer". Jet. Johnson Publishing Company. 68 (14): 54–55. ISSN 0021-5996. Retrieved September 20, 2014. ↑ Walters, Barry (September 1987). "Diana Ross: Red Hot Rhythm and Blues". Spin. Spin Media LLC. 3 (6): 26. ISSN 0886-3032. Retrieved September 20, 2014. 1 2 3 "Police Say They'll Seek Charge Against Singer in Fatal Crash". Associated Press. January 13, 1986. Retrieved January 20, 2014. ↑ "Passenger Dies in Crash of Car Driven by R&B Singer Vandross". Los Angeles Times. January 13, 1986. Retrieved January 20, 2014. ↑ "People in the News". Associated Press. January 18, 1986. Retrieved January 20, 2014. ↑ "Luther Vandross Injured in Three-Car Collision; One Passenger Killed". Spin. 69 (19): 14. January 27, 1986. Retrieved January 20, 2014. ↑ "Local News in Brief : City Settles in Car Crash". Los Angeles Times. December 10, 1987. Retrieved February 18, 2014. ↑ "Timeline". Luther Vandross. Retrieved November 18, 2015. ↑ "7 Creepy Saturday Morning Monsters". MTV. October 28, 2011. Retrieved November 19, 2015. ↑ Bookbinder, Adam (April 21, 2014). "Luther Vandross' Top 5 Smooth R&B Songs". 94.7 The WAVE. Retrieved November 18, 2015. ↑ Waldron, Clarence (November 5, 1990). "Whitney Houston Talks About Her Long-Awaited Album, 'I'm Your Baby Tonight'". Jet. 79 (4): 34–36. Retrieved November 18, 2015. 1 2 "People Are Talking About...". Jet. 82 (7): 61. June 8, 1992. Retrieved November 18, 2015. ↑ "Robert Townsend's 'The Meteor Man' Uses Cast of Stars to Battle Drugs, Violence and Gangs". Jet. 84 (15): 58–61. August 9, 1993. Retrieved November 18, 2015. ↑ Trust, Gary (June 3, 2014). "Mariah Carey's 25 Biggest Billboard Hits". Billboard. Retrieved November 18, 2015. ↑ "Luther Vandross Signs with Clive Davis' New Label, J Records". Jet. 98 (20): 38. October 23, 2000. Retrieved November 18, 2015. ↑ Hiatt, Brian (June 18, 2003). "Ailing Luther Vandross tops the album chart". Entertainment Weekly. Retrieved November 18, 2015. ↑ "Vandross Hits Career Peak as Health Improves". Billboard. 115 (26): 71. June 28, 2003. Retrieved November 18, 2015. ↑ "Vandross Video Features Famous Friends, Fans". Billboard. July 19, 2003. Retrieved November 19, 2015. ↑ "R&B Legend Luther Vandross Dead". ABC News. January 6, 2006. Retrieved November 15, 2015. ↑ "Luther Vandross dies at age 54". Today. Associated Press. July 2, 2005. Retrieved November 15, 2015. ↑ Weinstein, Steve (April 2006). "The Secret Gay Life of Luther Vandross". Out. pp. 60–64. Retrieved September 5, 2016. 1 2 Anderson, Brooke; Leopold, Todd (July 1, 2005). "Luther Vandross dead at 54". CNN. Retrieved May 24, 2014. ↑ Smolowe, Jill (October 20, 2003). "Luther Sings Again". People. 60 (16). Retrieved November 15, 2015. ↑ Silverman, Stephen M. (March 2, 2004). "Ailing Vandross Won't Attend Grammys". People. Retrieved November 15, 2015. ↑ "Vandross left money to diabetes group". UPI. April 6, 2009. Retrieved May 24, 2014. ↑ Adler, Bill (February 28, 1983). "Singer, Producer and Grammy Nominee Luther Vandross Is R & B's Heavyweight". People. Retrieved May 24, 2014. ↑ "Luther Vandross". Soulmusichq.com. Retrieved February 23, 2014. ↑ "100 Greatest Singers: Luther Vandross". ↑ "SoulMusic.com". SoulMusic.com. Retrieved June 1, 2013. ↑ Blair, Elizabeth (November 29, 2010). "Luther Vandross: The Velvet Voice". NPR. Retrieved November 15, 2015. ↑ "Finally". Los Angeles Times. June 20, 2006. Retrieved November 19, 2015. ↑ Cohen, Jonathan (August 31, 2007). "Rare Cuts Bolster Four-Disc Vandross Box". Billboard. Retrieved November 19, 2015. ↑ Gundersen, Edna; Barnes, Ken; Jones, Steve; Mansfield, Brian; Gardner, Elysa (November 23, 2007). "A box set for every musical taste". USA Today. Retrieved November 19, 2015. ↑ Harvey, Kyle (May 30, 2014). "Luther Vandross to receive star on Hollywood's walk of fame". The Grio. Retrieved June 4, 2014.